Its nothing like coming back from vacation and receiving new music in you inbox, new music that actually means something! 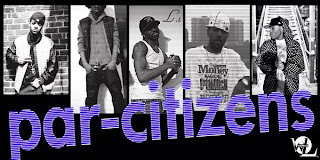 This new gem comes from the group known as Parcitizens! called "Ur girl chose me," where they all completely GO-In (pause) over the UGK classic track "I Choose You." You can listen and make sure to DOWNLOAD HERE! I'm also happy to announce that PARCITIZENS will be headlining my next Underrated & Overdue mixtape (Best of the Bronx) so please stay on the look out for that!! Every now and then us djs come across a mixtape which really stands out, that freshness, that new new, something different and real at the same time. We often hear thousands of records that we say are HOT and run into artist who claim to be "the next" but more than likely their songs are mediocre and not that much different than any other song you've heard recently. That's why I was so delighted to meet into this new artist 6S on twitter (http://www.twitter.com/Ainslee6S), she sent me the link to her newest mixtape and I can say I listened and enjoyed the entire joint from start to finish, even the intro was a plus!! Believe me, this is hip hop at its finest. Tracks like "Untitled" and "Drinking Games" are so catchy you have no choice other than to put on your headphones and nod to these. We all have heard of saving the best for last and thats what she accomplished with the last track entitled"No, No, No" which was her best track, IN MY OPINION but Im sure she has bangers for you as well! This is the type of music/EP that djs like myself get all excited over, that under the radar raw talent and I cannot WAIT to see what the future has in store for her. Please check her out and show some love once you have listened to the EP completely. 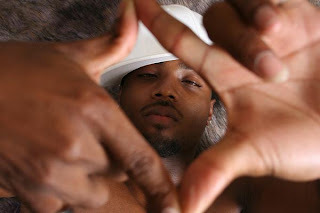 TREY SONGZ GOES AT KELLZ!! This is why I dont sleep!! When you sleep, you miss out on the best things, please believe that. Last night on his live stream, Trey Songz (http://www.twitter.com/songzyuuup) covered the DOA track from Jay-Z as he went at the Pied Piper. When I heard this song was about to be leaked, I couldnt believe it, I mean, who goes at Kellz? TREY DOES, thats who, and did a damn good job at it I MUST SAY!! Just listen to the track and be the judege for yourself!! He also has a track for the ladies right after that featuring DRAKE, what could be better! This is what I mean when I say GREAT MUSIC! Thanks for the visit and send a friend.. I had the pleasure of working with FREDDiE MAC in 2002, I know its seems like forever and some of you may wonder why you have never heard of him until now. After speaking with him, he told me that he was through with Hip Hop Battles (which he had won the last 7 and retired from Hi Hat 2000, a very popular club in Hattiesburg, MS, check out DJSWEAT2000 (http://www.twitter.com/djsweat2000) for more details) and wanted to concentrated of finding a more comfortable way to live and getting away from the battles was one thing he stressed mainly. He then moved to Maryland and jumped into the real estate business. I'm guessing with the money that was coming in, rap wasn't his biggest priority, until NOW and once again, Im glad that I know this guy. I told him he was gonna be a problem way back then, just by the way he puts lyrics together and the things he comes up with. Trust me when I say this, and this is in NO DISRESPECT to Mississippi artist, but this guy was WAY ahead of anything I heard while visiting and with this newly released track, he proves he has not lost it at all. We all know that talent resides EVERYWHERE, not just NEW YORK CITY and LOS ANGELES and ATLANTA. Admist of the locations I have visited, hosted parties, hung out with celebs, popped the bottles, you know the usual ROCK STAR LIFE (yeah right!) DC is one of my favorite places to visit, not only because of the history, but the culture is so diverse, no one feels left out! 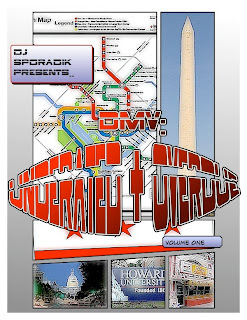 The DMV (which most call the area which consist of DC/Southern Maryland/Northern Virginia) is bursting with HIP HOP Talent but it is often overlook by the deep vibe of Go Go Music which the city is known for. Wale (http://www.walemusic.com/) is slowly changing this trend and setting the mark high for others to come after. That is why I decided to start off my mixtape catalog with the DMV. Showcasing their talent would be an honer for me in itself. I already have a few who are a lock in for the project, but if you know any other artist from that area, please have them send me their info (djsporadik@gmail.com) ASAP. This mixtape has a deadline by June 30th! First of all I would like to take time out to thank you all for coming thru to check on this site. There are millions of blogs, dj, artist etc and for you to grace my page is an honor. Most of you may know me from twitter (http://www.twitter.com/djSPORADiK) but I am more than a DJ. My goal is to break HOT records, artist, songwriters, producers. I think there are so many people in position to help artists but they choose not to. I am the furthest away from that. All I have is my word and it is what I live by. I don't hold anything back and I am as honest as they come. If you have any music, please send it my way (djsporadik@gmail.com) and I will take the time to go over it and may even post it on the site. Once again, I would like to personally thank you for being a part of the movement! I am the essence of the old school DJ. My role is to break records and discover artist who others look over. I am in the game for the love of HIP HOP in general.